Floridians from the Emerald Coast to the Nature Coast are urged to review their hurricane plan and be prepared to act on it within a couple of days. Tropical Storm Michael formed over the western Caribbean Sunday morning, and the National Hurricane Center says it could become a hurricane in the Gulf of Mexico by Wednesday. 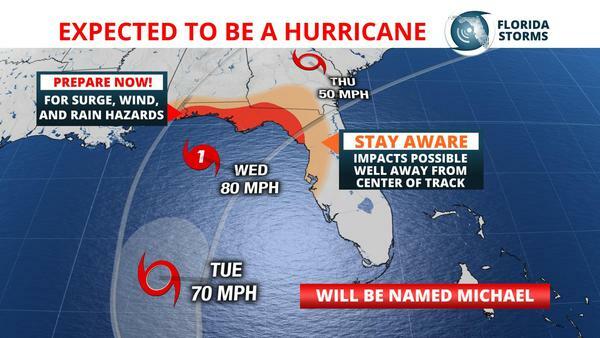 Early forecasts then call for it to make landfall somewhere between Mobile, Alabama and Cedar Key, Florida. As of Sunday morning, Tropical Storm Michael was located 90 miles south of Cozumel, Mexico and had maximum winds estimated at 40 mph. Satellite data suggested the depression was producing a significant amount of thunderstorm activity on its eastern side and was drifting north-northwest at 5 mph. NOAA's Hurricane Hunters were en route to investigate the system Sunday afternoon. 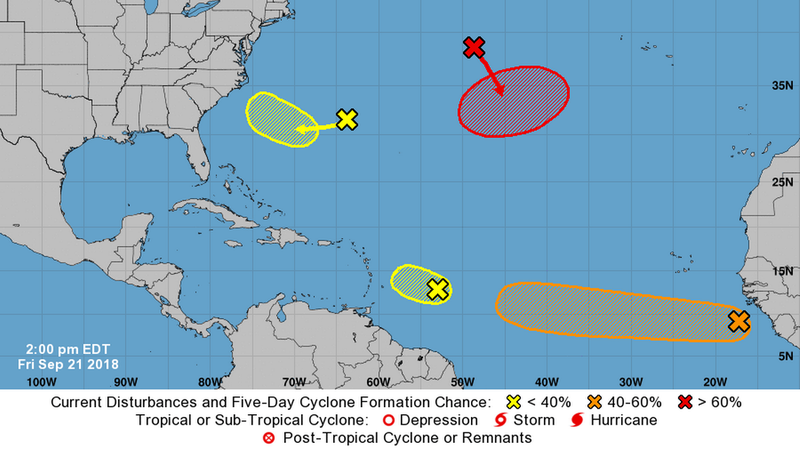 In his 11 am advisory, National Hurricane Center Specialist Dan Brown said then Tropical Depression Fourteen was being hampered by strong upper-level winds (or wind shear), but those winds were expected to relax some over the next 48 hours. The storm is then expected to move into a more favorable atmospheric environment Tuesday, where he noted “nearly every piece of intensity guidance” brings it to hurricane strength before it reaches land sometime Wednesday or Thursday. Forecast confidence on the track of Tropical Storm Michael is higher than normal due to run-to-run consistencies of several forecast models over the past two days. The clockwise steering currents around an upper-level ridge of high pressure over the Mid-Atlantic states will keep the storm on a north-northwestward track through at least Tuesday. A trough of low pressure approaching from the Central U.S. is then likely to weaken the ridge and allow for a turn to the northeast as the storm approaches land. The timing and intensity of Tropical Storm Michael at landfall are more difficult to pin down at this point. The models exhibit a large spread in possibilities on forward speed beyond Tuesday. This correlates to a large range of ideas on strength as well, with the faster models coming in weaker and the slower runs stronger. The amount of time Michael spends over water could play a large role in how strong it becomes. A faster storm, for example, would have a smaller window of opportunity to strengthen and come up just shy of hurricane status. Conversely, a slower moving system might be able to strengthen into a Category 2 hurricane prior to landfall later in the week. Forecasts of a developing tropical system are not as reliable as they are after the system matures. The added data from hurricane hunter missions will also help to improve the quality of future forecasts. According to National Hurricane Center statistics over the past five years, the track error for a tropical system in the Atlantic basin at 72 hours falls within 105 nautical miles either side of its center more than 60 percent of time. 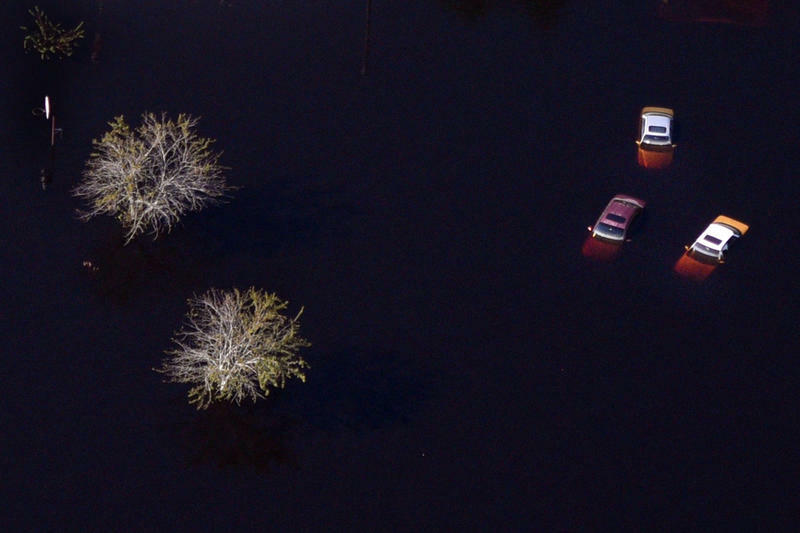 The Florida Public Radio Emergency Network will continue to monitor the progress of this system and provide more frequent updates as they become available.